Pontoon boats are one of the fastest growing segments of recreational boating, and Ameritex is quickly becoming the preferred provider of pontoon boat covers and pontoon boat enclosures to some of the best brands in the business. 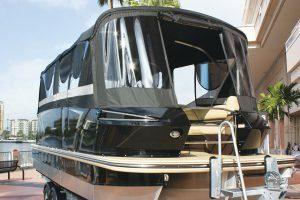 Depending on your boat’s make and model, AmeritexDirect can supply an exact duplicate of your original pontoon boat camper top, Bimini top, enclosure curtains, playpen cover, and more. Each part will be custom sewn in our ultramodern facility to the exact same specifications as originally specified by the builder of your pontoon. They will ship quickly and ready to install. And, if we made your original pontoon boat enclosure, it means we also made the frame or pontoon boat cover support system that goes along with it. We’re happy to provide you with replacement parts for those as well. We can supply an entirely new pontoon boat top, complete with frame. Or, if your frame is fine but the fabric cover has seen better days, we can simply sew new replacement fabric to go on your existing frame. Most importantly, your new pontoon boat cover or pontoon boat top will be an exact replica to replace your worn out parts. Find out if we offer a pontoon covers for your boat here.